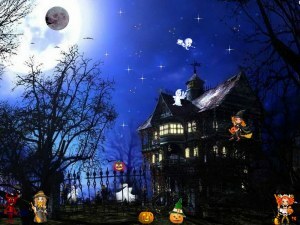 Halloween is around the corner, and it is a holiday that every child (and adult) looks forward to. The children get to enjoy the adventure of trick or treating and for the adults; it is an opportunity to revisit their childhood. With all this excitement comes the bags of candy and the possible cavity nightmare for parents. Let’s face it; no parent wants to be “that” parent who denies their children the adventure of trick or treating. Neither do the parents want to be the odd ones handing out trail mix, and cracker snack-packs, while the rest of the parents are handing out Twix, jolly ranchers, toffee etc. Is the pleasure of a treat worth an emergency trip to the dentist? Children might h ave no qualms about biting into the jolly rancher or eating sticky candy with braces, but parents are the ones who deal with the ramifications-usually involving an emergency trip to the dentist. Since the holiday is inescapable, some healthy regimen can be implemented in order to prevent the nightmare of cavities and ruined braces. For example, Jolly Ranchers (hard candy) or any soft chewy candy is out of question for those wearing braces. Below are some practical steps to avoid Halloween becoming a nightmare for both the children and parents and achieve a happy medium. Consume Halloween candy and other sugary foods with meals as the saliva produced will be helpful in balancing the acid from the sugar. Avoid hard candy and other sweets that stay in your mouth for a long time. The more the sugar stays in the mouth, the greater the risk for tooth decay and cavities. 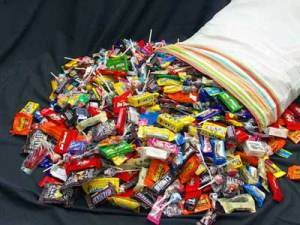 Parents should be in control on how much of the candy the children will eat. Don’t chew on extremely hard candy, especially if you have dental fillings. This might break the tooth and/or the filling. So parents, as your children bring in the bags of candy, watch for their candy intake, and save the rest for later. But most of all, enjoy the thrill of the holiday!